Writer-director B.Unnikrishnan has had a mixed fortune at the box office with his Malayalam movies. His most notable success came in the form of Madambi starring Mohanlal in the lead. This pair of Mohanlal and B.Unnikrishnan re-unite now with Grandmaster which marks the entry of UTV Motion Pictures into Malayalam Cinema. 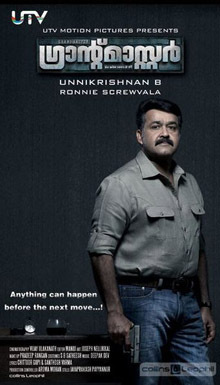 Grandmaster is an investigative thriller with Mohanlal playing the investigative cop. The film has an interesting star cast which apart from Mohanlal also features names such as Narain, Priya Mani, Anoop Menon, Jagathy Sreekumar, Roma, Siddique etc. With music by Deepak Dev and cinematography by Vinod Illampally, Grandmaster is likely to release on 12th April, 2012 ( Vishu release ). ← Alaipayuthey – Love, Marriage and Beyond? Another Turkey from the Fatso.When was the last time this Unni made a movie which was watchable apart from Madami, which one could barely sit , and was borrowed from every other Malayalam Movie of Past Decade. I still can’t recover his misadventures like I.G, Smart City and as script writer cover story, Shivam. The trailer looks ok; thankfully Mohanlal wouldn’t be playing to the gallery here. The supporting cast is also quite good. But yes its the track record of B.Unnikrishnan that makes one feel cautious about the movie. Nevertheless I’ll be happy to be proved wrong if the film turns out good….. The trailer looks ok & thankfully Mohanlal wouldn’t be playing to the gallery here. The supporting cast is also quite good. But yes its the track record of B.Unnikrishnan that makes one feel cautious about the movie. Nevertheless I’ll be happy to be proved wrong if the film turns out good…..
Agree, trailer looks ok and the past couple of years, Lal hasn’t associated himself with superstar action movies atleast. The movie may not be great but even if it’s above average, Unnikrishanan would have done his track record something good. His segment in ‘Kerala Cafe’ was manageable…. trailer really lookzzzzzz thrillinggggg.SEEMS TO BE SOMETHING DIFF.